The Immense Power of Art Can Get You Through Anything! My name is Enrico Miguel Thomas and I am a famous artist in New York City. In the writing of this article, I would like to spread the message that art has such an immense power to get you through anything! Life didn’t start out too well for me. At the age of three I almost lost my life because my mom fell into an abusive marriage. I was surrounded by horror and violence most of the time and when my father burned me in a scalding hot shower I ended up with third degree burns on about sixty percent of my body. Because of significant scarring on my face and scalp I had to endure three reconstructive surgeries. Growing up with shame in school and constantly being embarrassed by the scars eventually turned to tremendous anger so I would always turn to my drawing talent which helped me forget about the pain of having the physical scars. I never felt like I fitted in anywhere and one day I ended up in a fight on the street while I was living at a homeless youth shelter. I was charged with a felony because the man and the people he was with lied and said I hit him with a pipe and tried to rob him! I felt as though my whole life had vanished before my eyes! It was as if I was in outer space and had fallen into a black hole! I wasn’t in space though, I was in the real world and I was in big trouble! Even though I was completely exhausted, I spun around in my seat and paid attention to every single word he spoke! He was a tall African American man with a large Afro and dark sunglasses. I didn’t know it at the time but I had an angel on my side, because I didn’t just have any lawyer! My lawyer was Kevin Sylvan, one of New York City’s top criminal lawyers. He was there as a volunteer! His voice towered above the prosecutor’s, smashing every argument she had for keeping me behind bars. Within minutes I was released! About a month later he was also able to get me in front of a grand jury, and after they heard the case, the felony was brought down to a misdemeanor. I returned to the youth shelter and got myself into counseling for my anger and started doing my art work again. I always had a gift for drawing since I was eight years old, and it has helped me get through so many difficult times in my life. In the most recent youth shelter that I was in a resident advisor there would always encourage me to draw and paint and helped me apply to art school. The next thing I knew I was at Pratt Institute! One of the top art schools in the world. I managed to graduate from there in 2006 with a Bachelors of Fine Art degree! Today I am nationally recognized for my subway drawings by Sharpie US and the New York Times! I was lucky enough to avoid prison, thanks to Kevin Sylvan, who always knew I was a good guy. Still there are so many good youth in prison now who were not so fortunate. They were angry, felt hopeless and lost, just like I was. This is the reason for writing this story. If I could offer hope and inspiration with the additional and most important message to keep moving even when it seems hopeless, then maybe I could reach even one young guy who is facing the very situation I faced years ago. Enrico Miguel Thomas is an artist currently residing in New York City. He has been drawing since the age of eight and hopes to to teach the world through his creativity that art brings new life! 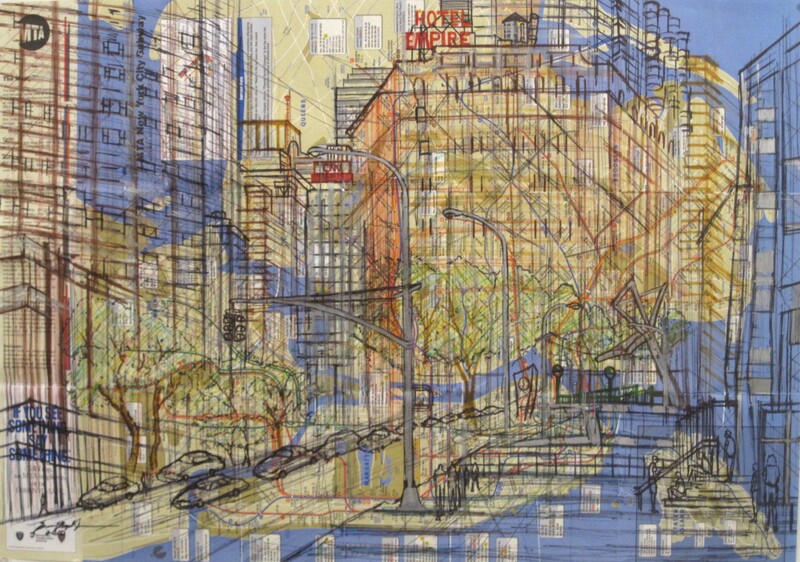 He holds a fine art degree from Pratt Institute and has been recognized both nationally and internationally for his beautiful and complex architectural drawings of the city of New York. Enrico is currently engaged in a project involving the New York City Transit System involving the translation of the everyday life of the New York City subway commuter into his beautiful architectural drawings. He is also known for using the actual New York City Subway map as his drawing paper. Most recently Enrico was featured in a national TV Spot by Sharpie US that can be viewed at EnricoMiguelThomas.net. Ultimately Enrico wants to inspire and teach the world to look within rather than without for personal happiness and the spark to create. Enrico can be contacted at Emtart@gmail.com. More of his artwork can be seen in our Gallery.